Seventeen more days until we get possession of our new house! I am freaking out a little about all the things I have to get done in the next 17 days but I am so excited to start this new chapter. My mat leave is also up and I start back at work next week which will be a huge adjustment especially in the midst of moving. Our closing date is exactly 1 year from the date we moved out of our first house and we are so ready to be in our very own place as a family of 5. Waiting a whole year for a house to be built is really hard for someone like me who obsesses over room layouts and furniture pieces. I think I must have drawn out about 45 different possible layouts for our new house on our floor plan from the builder. We kept the majority of our furniture from our first townhouse but we do need to purchase a few big items such as beds for the girls, dining table, accent chairs. As a young family with 3 kids we really need to try and be as budget conscious as possible so we have mostly been looking at Ikea, overstock and thrift shops. 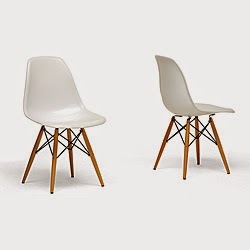 These amazing Eames look a like chairs are from Overstock.com. Only $200 for 2 chairs!! I am so excited about this because I have been looking for chairs like these all over Internet land and the average price seems to be between $200-800 a chair. This dining table from Ikea. Only $299 and can fit up to 6 people. They have a bigger version as well but this size is perfect for out teeny tiny townhome. I have been seeing this children's bed from IKEA a lot lately and I love love love it! I have to admit that when I saw it in the store I wasn't wowed by it but after seeing it used in several kids rooms on Pinterest I have fallen in love. I also love the price tag - under $200!!! I love that it can be used as a loft bed, bunk bed, or canopy bed. We are planning on using it as a bunk bed and it gives me such piece of mind that it is not super tall, and there is almost a built in bed rail so I don't have to worry about any terrible falls. I also love how the bottom "bunk" is right on the ground to give it a very lounge type feel. What are your favourite budget friendly home stores?